There is one thing that matters (and one thing only) in the realm of internet marketing: Converting the random web surfer into a pre-qualified, pre-sold visitor to your website. There is a way to drive a stream of targeted, pre-sold, pre-qualified traffic to your website. Write a few articles that are interesting, helpful and unique. It’s that simple, really. Take a look at how getting a few articles published makes a world of difference in your actual conversion to subscriptions and sales. When you give someone some very good information in your article, they become familiar with your work. Think of your article like the “free sample” you get at the grocery store. You try the bit of pizza or the latest cheese spread, and then you buy some to take home for later. Your article introduces your expertise and gives the reader a look at the quality of your work. They become familiar with you, with your point of view, with your “take” on things. Once someone has finished reading your article, they will have a “feeling” about what you have written, and they will agree or disagree with your stand on the topic. Those who agree with you are more likely to visit your website to hear more of what you have to say. When you write an interesting, helpful article, newsletter editors seeking good quality content will want to publish it. These publishers know their audience. Most newsletters are published around a particular topic or theme. The subscribers to this newsletter are interested in this theme, that’s why they continue to be subscribers. That means that when your article appears in this newsletter, it is automatically reaching your pre-qualified, perfectly targeted audience. You’ve got to get your article in front of newsletter editors. There are three simple ways to do this, and they are all quick, cheap and effective. You can do it yourself, or you can take advantage of a quick and easy approach (which we’ll discuss in a moment). You can submit your article to article announcement groups. These subscription email distribution lists allow you to send your article directly to publishers and editors seeking free content. There are literally hundreds of groups you can join. Some of the more popular are the Yahoo! Groups Article Announce ( http://groups.yahoo.com/group/Article_Announce ), The Write Articles ( http://groups.yahoo.com/group/TheWriteArticles ) and Best Free Content- Business ( http://groups.yahoo.com/group/bestfreecontent_business ) These groups are all looking for business related articles. There are article banks and repositories that accept articles by category. GoArticles.com and ezinearticles.com are some of the biggest players, while some new sites like www.content-articles.com and www.Niche-Content-Articles.com are just getting started and are eager to receive your articles. There are literally hundreds of thousands of ezines online – and they all need content. Niche website owners are looking to publish articles that their niche audience will find interesting. Contact the publisher – ask if they accept articles. Send a sample and see if they like what you write, then you can send them your articles and have them published. It takes some work, but it’s doable. You can submit all the articles you want, whenever you want, on any schedule you want, with a few clicks of your mouse. It’s how I drive thousands of visitors to my sites every single day. It is the hallmark of my success. I have automated the article submission process. Why? Because I quickly got tired of doing the manual work myself. Visiting sites, copying and pasting my article in different formats, remembering all the myriad usernames and passwords – and that was just the beginning. Each site has different guidelines and submission rules. Some have word count restrictions; others don’t want more than one article per week. Each site has specific categories and content restrictions. Trying to keep track of when I submitted my articles, where this article could go and where I should send that article, remembering which articles had already gone out, where I hadn’t yet submitted… it was overwhelming. I put together a tech team and I said, “I don’t want to do this by hand anymore.” We sat down and designed a system that automatically manages the guidelines, formats the article according the needs of the publisher, inserts the “reprint rights” boilerplate for the article sites that require that, incorporates my resource box and formats the whole thing with the correct number of characters per line. What used to take me hours and hours of effort is now completed in less than five minutes of my personal attention, and then the system does all the work. My articles get wide distribution. I get traffic every day from the articles I publish, and because the system is constantly monitoring the web, my list is always up to date with current publishers and repositories. When a site disappears, it comes off the list. When a new site pops up, it is incorporated into the list, complete with the categories it accepts, the author terms of service that must be followed and the publishing guidelines. I don’t have to remember – the system does. So the choice is yours. You can certainly submit your articles by hand to newsletter editors and article banks. It’s completely free, it just takes you a bit of time. You’ll want to keep a log of the places you submit to, and the dates, since it may take you several weeks to achieve full distribution. With the quick and easy method, I put each article into the Article Marketer system only once, I don’t have to keep track of which sites I’ve submitted to – because I know that the system automatically submits the articles to as many places as possible. It frees me up to do other things – all I have to do is sit back and wait for the traffic to roll in. With my this quick and easy method (Article Marketer), I don’t have to do any of the drudgework by hand anymore and I get to focus my time and effort on building my business, instead of sitting at a computer filling out web forms by hand. Isn’t that what you’d like to do? Chris Ellington gives effective and easy to implement marketing strategies to internet marketers, small business owners and home business entrepreneurs. 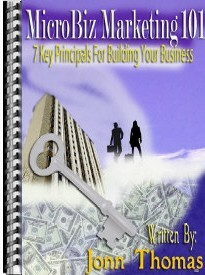 His Article Marketer site is a favorite of internet marketers around the world.